A new style of performance saloon – brimming with passion, craftsmanship and driver appeal – comes to Europe in 2010 as the world’s newest luxury automotive brand Infiniti faces up to the traditional executive car hierarchy for the first time. 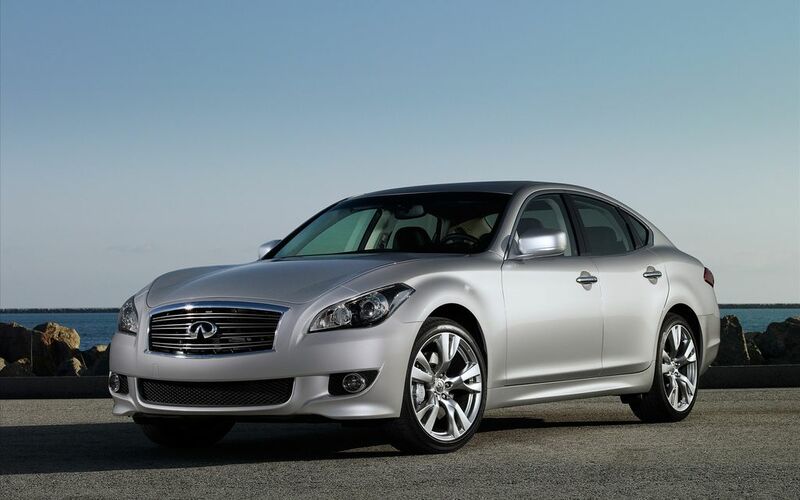 Power, performance and technology all come together with signature Infiniti sophistication in the all-new Infiniti M Line which makes its official public debut in the USA today, prior to European sales starting next September. Featuring industry-first features, advanced Safety Shield technology and displaying Infiniti’s unswerving commitment to passionate design and a rewarding drive, Infiniti’s latest example of Inspired Performance will be the first M to be available in all of Infiniti’s 34 world markets – including Western Europe. A more exclusive alternative to the traditional stalwarts of the executive class, such as the BMW 5-series and Mercedes E-Class, the M Line goes on sale in European showrooms from September 2010 with petrol and diesel V6 power options, while an innovative petrol-electric hybrid is due to join the range in Europe in 2011. 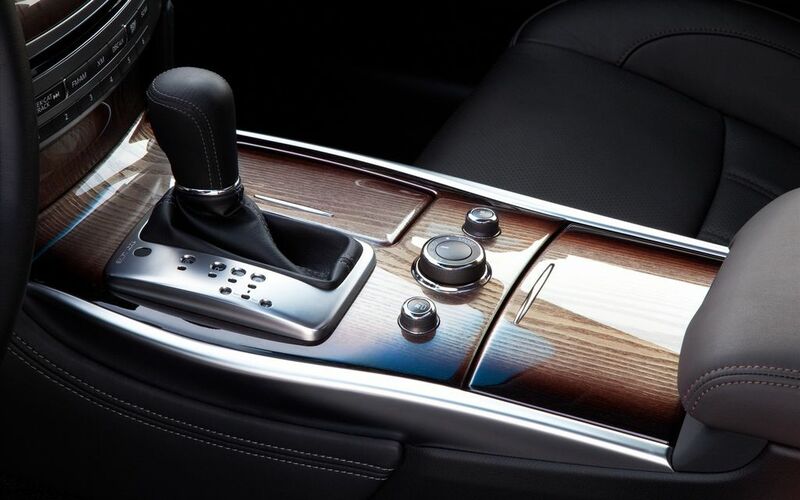 All will have a seven-speed automatic transmission. The M Line takes Infiniti’s saloon range in Europe – which also includes the G37 – to a higher new level, inside, outside and on the road, too. 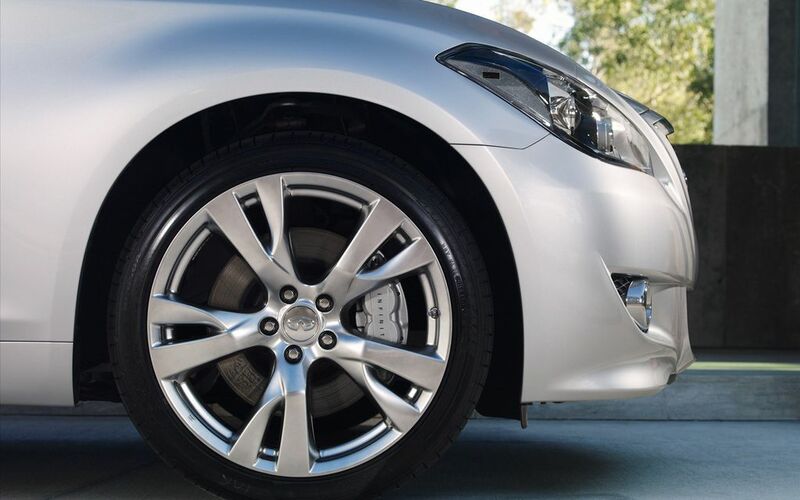 The Infiniti M combines rear-wheel drive poise with impeccable luxury credentials in a 4945mm-long saloon with space to spare inside the best designed and finished cabin that Infiniti has ever offered. As flagship saloon for the brand, the M Line also revels in the uniqueness that is Infiniti, from the flowing lines of the Essence concept car-inspired profile and the integrity of the natural materials used, to the pledge of an utterly hassle-free ownership experience. The new, third-generation M Line has been able to call on key Infiniti strengths in order to satisfy more demanding European drivers. These include lightweight aluminium componentry, adaptive technology, race-bred engine design, sophisticated chassis design with almost perfect weight distribution and proven double-wishbone suspension with the availability in some models of Infiniti’s sports handling technology, 4-Wheel Active Steering (4WAS). It debuts many new features such as Blind Spot Intervention, Infiniti Drive with Eco mode, Active Noise Control and the Forest Air climate system which are explained in more detail in the next section. To the benefit of looks, ride and cabin room, the M also has one of the longest wheelbases in the class. Finally, its body is one of the most aerodynamic on the road, too. The new Infiniti M has its first outing – in the metal – at an unveiling in Beverly Hills, California, yesterday (December 1) prior to US sales commencing in the spring. An earlier debut, in August this year, was as a “virtual” car created in 3D by video mapping – presaging a trend for “firsts” that the new M Line is well placed to expand upon. The latest in a list of world-first safety features from Infiniti, BSI takes blind-spot technology to another level by introducing an element of side collision protection. As well as giving the driver both visual and audible warnings of another vehicle in the blind-spot area which is detected by using radar, BSI intervenes if the driver ignores the warnings and attempts to steer into the other vehicle’s path. The intervention is in the form of a directional adjustment, executed automatically. This is achieved by selective braking on one side of the car to create a “yaw” effect that eases the vehicle back into its original lane. By identifying undesirable sounds in the cabin and then playing back through the speakers sound waves of opposite phase, the original noises are cancelled out, making the M’s interior a quieter, more restful place to be. The system is aimed at reducing undesirable low-frequency engine sounds only. M models with the 16-speaker Bose® Studio Surround® sound system are equipped with Bose Engine Harmonic Cancellation (EHC) which is even more effective at controlling unwanted noises. The M’s throttle sensitivity and transmission mapping are fine tuned according to which of four driver-selectable modes is engaged via a switch positioned behind the gear lever: Standard, Eco, Sport and Snow. The Eco mode utilises green and yellow lights on the instrument panel to provide feedback on fuel efficiency. Eco mode also introduces a new Infiniti concept known as the Eco Pedal. If driving too aggressively, the driver will feel the accelerator pedal “push back” to indicate fuel is being wasted. Sport mode changes the automatic shift points and enhances throttle response for increased performance. It will also adjust the 4WAS for a nimbler feel and raise the ESP intervention level. Infiniti believes the quality of the air within a car’s cabin has a direct bearing on the well-being of driver and passengers. Which is why it developed Forest Air, Infiniti’s most advanced climate control system that makes its debut in the M Line (depending on model). The system offers unrivalled temperature, humidity and pollution control while re-creating the gentle breezes and subtle scents of an environment known to promote alertness and relieve stress: the forest. The M Line benefits from Infiniti’s latest electronic stability program which optimises control of braking and engine torque on individual wheels to achieve smoother and more stable cornering. The system can apply selective braking to help create increased steering response when rapid changes of direction are required, such as in S bends or fast lane-change manoeuvres. 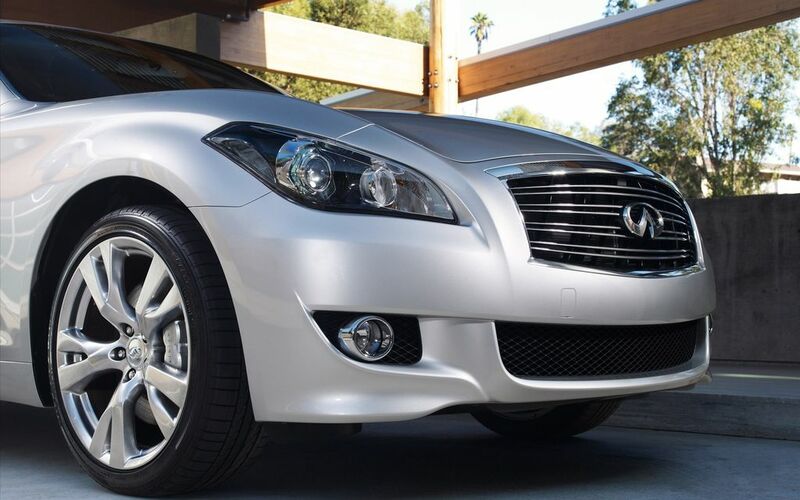 For the 2011-model year M Line, Infiniti’s 360-degree “bubble of protection” around the car known as the Safety Shield becomes more complete than ever. New features such as Blind Spot Intervention and Dynamic Cornering Enhancement are fully integrated into existing Safety Shield technology such as Intelligent Cruise Control (full speed range), Lane Departure Warning (LDW) and Lane Departure Prevention (LDP), Distance Control Assist (DCA), Intelligent Brake Assist (IBA) with Forward Collision Warning (FCW) and Front Pre-Crash Seat Belts. The M’s design is signature Infiniti, its subtle curves and complex surfacing endowing it with an emotional draw that goes beyond the colder, more austere class norm. Its deeply sculpted door surfaces and front bumper section add distinction and a sense of both aggression and intrigue. The body crease below the glasshouse is the clearest of many design cues picked up from Essence, the stunning Infiniti concept car that made its debut at the Geneva Auto Show early in 2009. To the benefit of both performance and efficiency, the M is adept at carving through the air. Its drag coefficient is a mere 0.27 and the body has been designed for zero lift at the front and rear for increased high speed stability. As with other Infiniti models, the M is equipped with lightweight aluminium doors, bonnet and boot lid (as well as an all-alloy V6 engine). The M uses the advanced FM (Front Mid-ship) platform that positions the engine behind the front axle resulting in an optimised front-to-rear weight balance for naturally stable and rewarding handling. Suspension is double-wishbone in front and multi-link at the rear, along with front and rear anti-roll bars. The standard wheel size is 18-inch. For the sportiest models, 20-inch wheels, new double-piston shock absorbers, special suspension settings, 4-piston brakes and 4-Wheel Active Steering are all available. The M37 is powered by the charismatic 3.7-litre VVEL V6 petrol engine also used in other Infiniti models in Europe. All alloy and of tried and trusted motor racing-style ladder-frame construction, power and torque are unchanged, at 320 PS (316 bhp) and 360 Nm (266 lb ft) of torque. Standard on every M is Infiniti’s seven-speed Adaptive Shift Control (ASC) automatic transmission – complete with Downshift Rev Matching (DRM) and Drive Sport (DS) mode for full manual control via the available solid magnesium shift paddles behind the steering wheel. Performance data is yet to be confirmed. 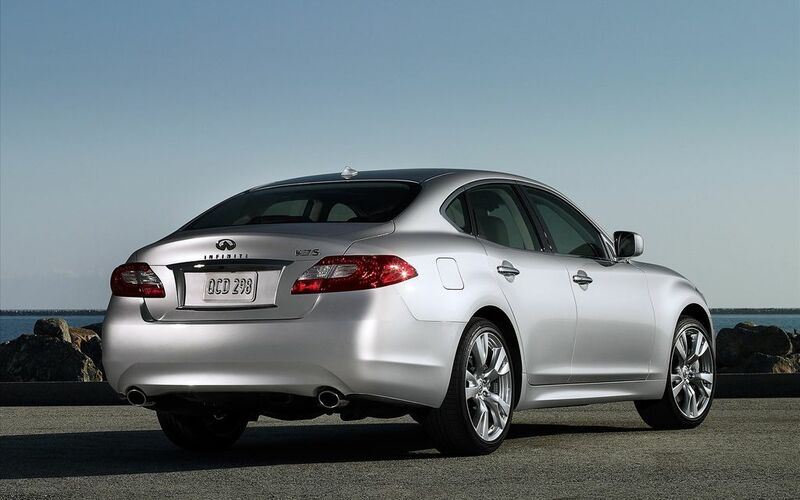 Infiniti will release more information about the V6 diesel version during 2010. 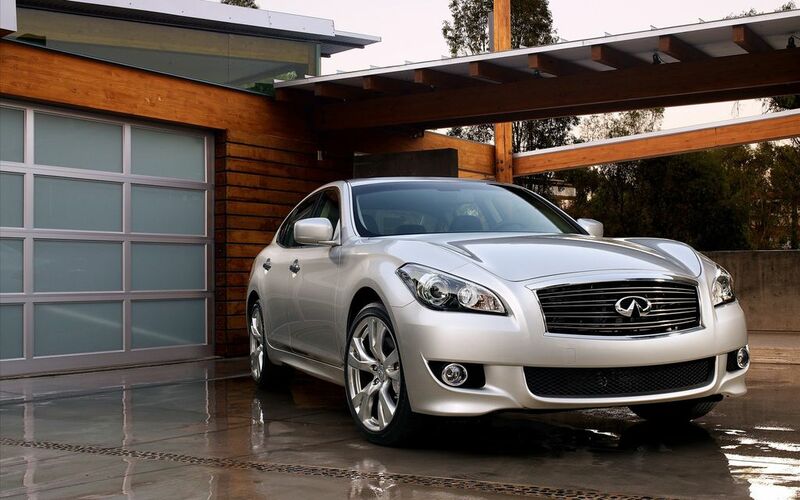 The new Infiniti M has an interior every bit as carefully crafted as its exterior. The result of extensive research by engineers and designers into every aspect of the cabin, from the shape of the switches to the softness of the textures, the aim was to create Infiniti’s best saloon car interior ever, with human warmth and an outstanding level of luxury appointments. And all with that most important of Infiniti traits: a clear focus on the driver. Mission accomplished then. The M cabin’s wow factor begins as soon as a door is opened: there can be no missing the perception of quality in everything that is seen, touched and felt – right down to the smallest details. Combining vibrant, Japanese-influenced design and luxury materials, it is an immediately alluring, sensual place, as well as notably spacious. The M’s wheelbase, at 2900mm, is longer than that of most competitors and this shows inside where there is plenty of room for five adults. Attention to detail inside takes many forms. Handcrafted wood accents, for example, have been treated with a unique powdered silver for a mirror-like finish that takes tradition into a modern age. The standard leather is quilted, but for those who want an even more sumptuous finish there’s the availability of semi-aniline leather. Distinctively textured aluminium highlights and, as standard, piano black trim make the cabin especially inviting. The signature Infiniti dashboard clock – always analogue – is reinvented in rectangular form, an elegant touch at the centre of the imposing new dashboard that blends luxury with technology in seamless fashion. The new dashboard also demonstrates Infiniti’s commitment to ergonomic excellence. The instrument panel features “Fine Vision” electroluminescent gauges and logically grouped controls for maximum ease of use. In addition, with the M Line, Infiniti is introducing a bespoke new generation of switchgear. Although prices, range structure and standard specifications are yet to be confirmed for European markets, the M is expected to follow in the tyre tracks of the G, EX and FX Lines in offering exceptional levels of standard equipment. Available features include climate control seats, bi-Xenon adaptive front lighting, premium Bose sound system, 10-way power adjusted heated leather front seats, heated steering wheel and the all-embracing Connectiviti+ multimedia platform with 8-inch VGA colour touch-screen display for the hard disk drive navigation which includes – uniquely – the Michelin Green Guide with information on hotels, restaurants, places of interest and even scenic driving routes.